Messy Me are delighted with the Gold Award for their High Chair Cushions for Wooden High Chairs from Bizzie Baby. The Cushions (a 2 part set) are a stylish yet practical way to keep little ones more comfortable at messy mealtimes. Customers love the design, which allows the cushions to be fitted and removed without needing to remove harnesses or baby sets. The wipe clean fabric helps ensure the cushions are quick and easy to clean after messy mealtimes. Made using their signature oilcloth, the beautifully classic and neutral colours and designs are felt to complement the more stylish designs of wooden high chairs as well as blending well with kitchen decor. 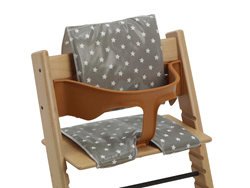 Wooden high chairs can be hard and uncomfortable for little ones at mealtimes – these cushions really do make mealtimes more comfortable, whilst ensuring cleaning up afterwards is quick and easy. With splashmats and 2 styles of bib available in matching colours and designs, Messy Me brings some style to mealtime chaos! The beautiful tunic bibs ‘the baby gives us wardrobe envy’ according to one mum! All the products are made in the UK, using high quality Danish oilcloth. The oilcloth is phthalate free and meets stringent Oeko-Tex 100 criteria – providing reassurance that the oilcloth contains no chemicals and components harmful to health. For more information on our trade offer, please email helen(at)messy-me(dot)com. We are also always keen to hear from relevant bloggers interested in reviewing our products. Please email info(at)messy-me(dot)com.